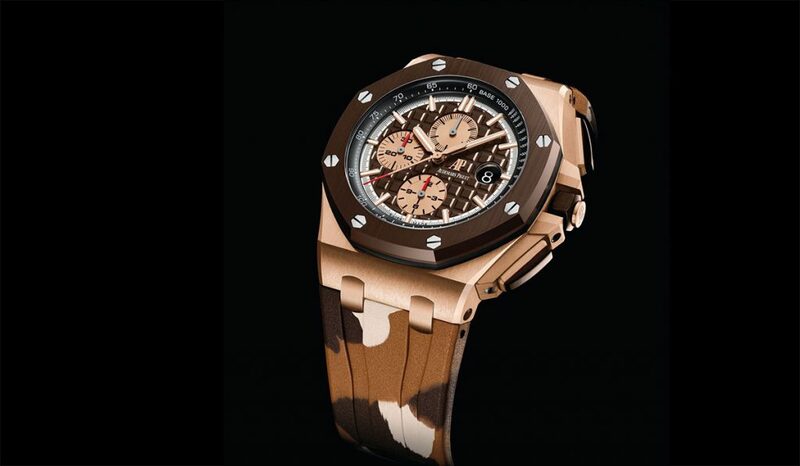 One of the purveyors of the camo trend is Audemars Piguet, a famously bold brand with annual sales in the nine digits. Last year, the luxury brand launched a Royal Oak Off shore chronograph watch with a khaki-green ceramic bezel and a green camo strap. Even though the strap was criticised by many watch enthusiasts, the company – true to irreverent form – has followed up on that timepiece with three new Royal Oak Off shore models with camo-print rubber straps in brown, blue or green. 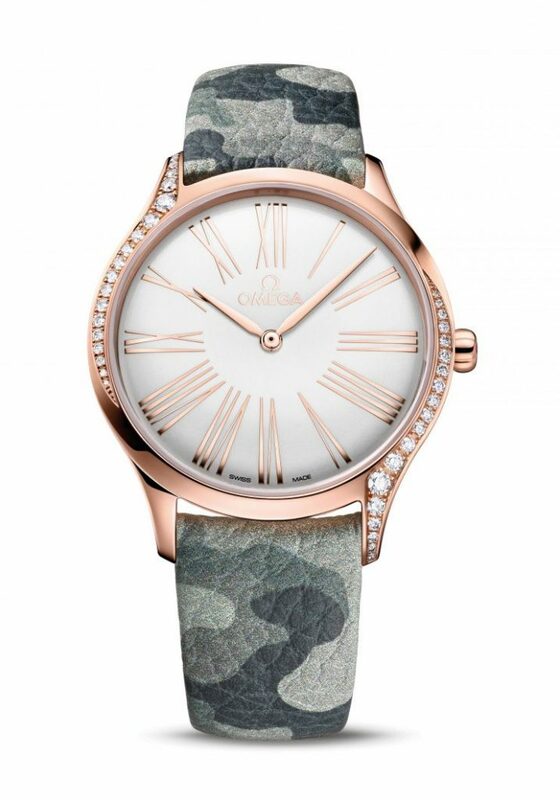 Other watch brands that have recently adopted a camo uniform include Omega (for its women’s De Ville Tresor watches, no less) and Armin Strom. While camouflage is currently riding a wave of popularity, the classic and once-utilitarian pattern has long been adopted by non-military folk looking to make either a political, cultural or style statement. In 1971, fashion bible Vogue printed its first story on camo, praising it as “functional, practical, good-looking”. For civilians, the first two qualities don’t seem particularly relevant, but, hey, we’d never quibble with “good-looking”. When Omega asked model Kaia Gerber (daughter of supermodel and long-time Omega ambassador Cindy Crawford) to choose new straps for its feminine De Ville Tresor watches (36mm or 39mm), she opted for camo in blue or beige leather. Comic illustrator Stanley “Artgerm” Lau has collaborated with independent brand Armin Strom on the 15-piece limited edition Animal Instinct. 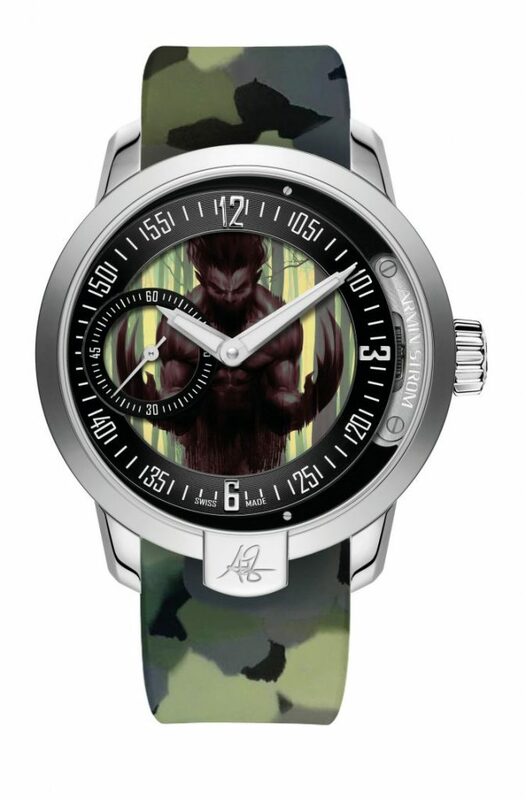 A camo-print rubber strap complements Lau’s illustration on the dial, featuring a character that represents “the raw courage and independence of the human spirit”.